Welcome to the unofficial shredded chicken sandwich home page. If you like chicken and you like sandwiches then this one is worth trying. They are simple to make and taste great - a real cut above the store-bought chicken spreads and a whole lot cheaper. 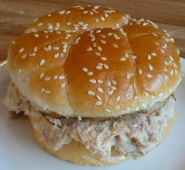 Note that this form of a chicken sandwich is generally available only in parts of Ohio. Many drive-ins and some restaurants carry them. We've compiled a list of over 170 places so far and they are all listed here. But they can be made and enjoyed anywhere! When I left Central Ohio for California fourty years ago, I experienced my share of "culture shock". Palm trees are tall and skinny, not at all like the enveloping maples and oaks. The seasons dropped from the easily detectable four to two - sunny and rainy. Winter holidays were snowless, more sandy claws than Santa Claus. Store names differed, food choices expanded, ethnic restaurants and health foods offered new taste treats. Amidst this "endless summer" environment something was missing - the shredded chicken sandwich! This staple, so readily available in my hometown of Newark (Licking County) was nowhere to be found in southern California. It soon became obvious that I would have to go further east to rediscover this tasty treat. On a car trip back to my hometown, I tried to order chicken sandwiches along the way. I got breaded patties or chicken breasts but no one recognized the term "shredded chicken". Not even crossing the Mississippi River led to these elusive goodies. Were these a true Ohio specialty like Buckeye candies or White Castles? (After all, even frozen White Castles are available, though expensive, in California). Alas, many of my fellow Ohioans were clueless to the shredded chicken terminology. Just how regional was the sandwich? One summer my husband (now a confirmed shredded chicken sandwich lover) and I searched counties surrounding Licking County to see if we could locate the sandwiches. We found that the area extends into Franklin County (adjoining Licking), but we did not discover them in Fairfield, Hocking, Muskingum, or Belmont Counties. During our chicken sandwichless years, we often made "pseudo-shreds" with canned chicken, cracker crumbs, and cream of chicken soup. These sandwiches reminded us of the delicacy we craved, but the did not come close to replacing them. For those of you who live in or near Northern or Central Ohio and wish to indulge in a shredded chicken delight, we include several locations to try, along with our totally subjective one-to-five hen rating system. Some of these locations may be open spring through fall only since many specialize as soft ice cream stands. For the rest of us, for whom shredded chicken trips to Licking County are few and far between, we offer my Aunt Dorothy's standard recipe. If the trend catches on, maybe Aunt Dorothy's Shredded Chicken Sandwich Stands could give the Old Colonel a run for his money! If you know of other locations or locales for finding chicken sandwiches, please let us hear from you at. Yes, the world wide web is indeed clogged with useless information like this. But if you happen to be one of those shredded chicken affectionados, you'll understand why the great search must go on. Shredded chicken sandwiches are a leftover from the days when everyone had chickens and you didn't butcher them until they quit laying eggs. By that time they were so old and tough that all one could do was make creamed chicken and serve it in buns or over biscuits. Fond memories of my childhood! Checkout the drive-ins and restaurants links above for the addresses of the places shown above. For the GPS minded, all of these places are listed in a points of interest (POI) file that can be loaded into your GPS unit. (The process varies by GPS brand/model. Check with your GPS manufacturer for details.) The file, in CSV format, can be found here and also over at the POI Factory. Sadly, some places go out of business. Here is a list of those establishments.